« Maja’s Special Chicken Meatballs…. I love strawberries in a salad, as jam on buttered toast, as a dessert in a parfait, in a smoothly, dipped in crystallized sugar, and of course dipped in chocolate. 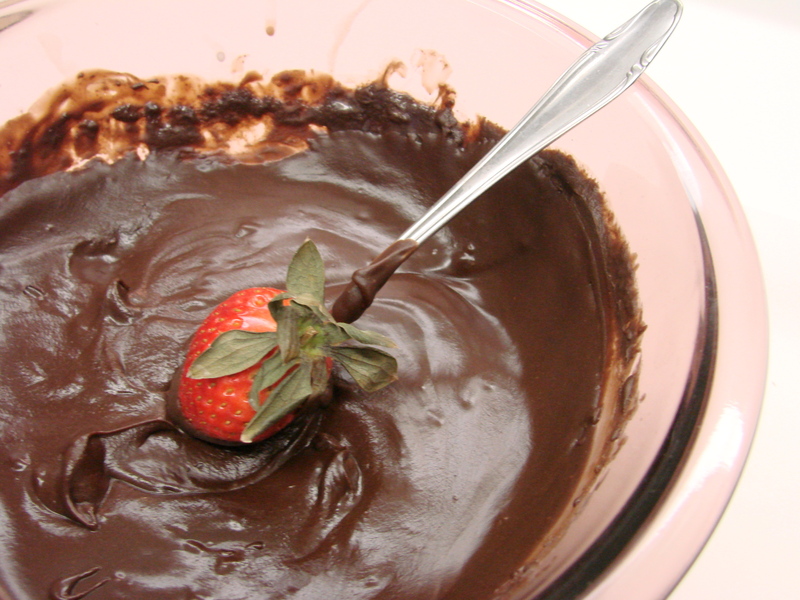 And it only became better when we dipped it into a ganache …. William Butler would have loved them too I am quite sure. Here is my recipe of the special ganache that I use for dipping this beautiful fruit into a decadent dark chocolate ganche enhanced by heavy cream, and a little Karo Syrup. Before I plate this incredible desert, I dust the leaves on the strawberries with a touch of powdered sugar. 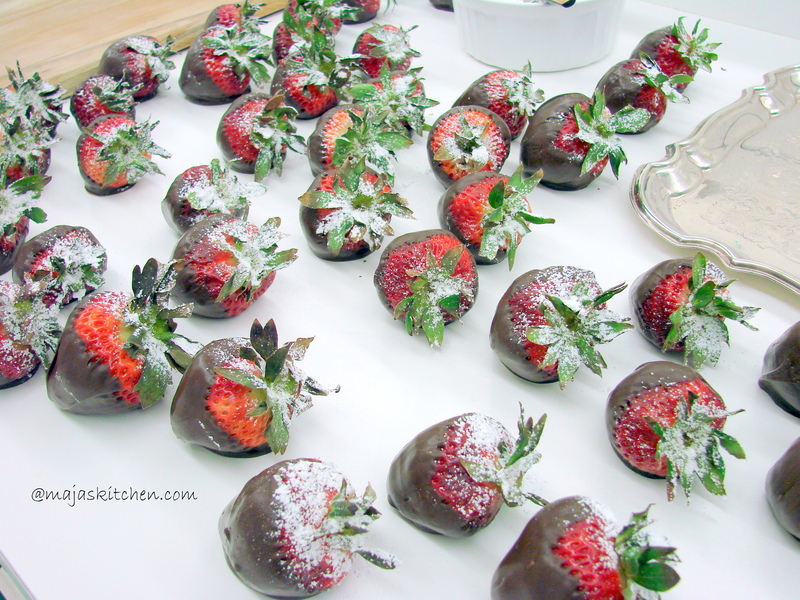 Parchment or wax paper to place the freshly dipped strawberries on top to dry. Wash the strawberries and let them dry on paper towels….this takes a couple of hours or so. Make sure the strawberries are completely dry before you dip them. 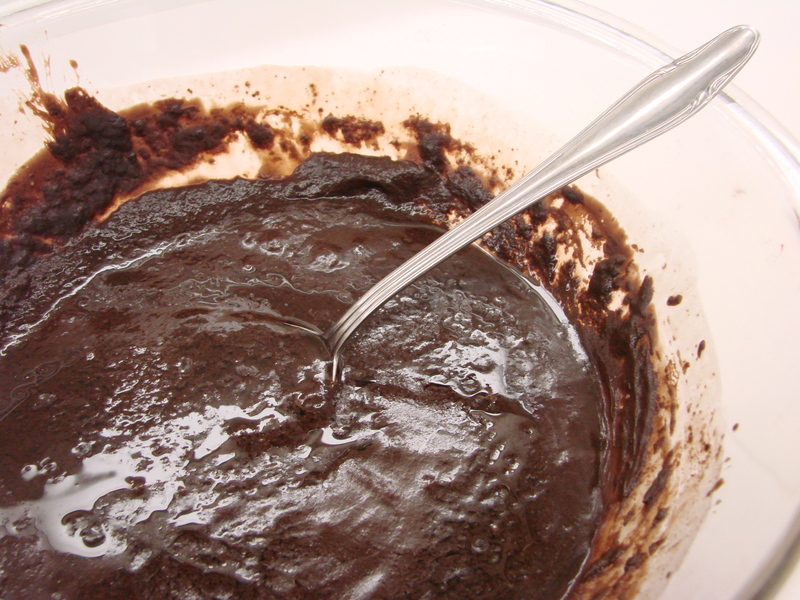 Weigh the chocolate to be 1 pound, place it into a bowl and add the 1 Tbsp of Karo Syrup and set aside. Now heat the 1/2 cup of heavy cream to just below the boiling point. When you see the first sign of skin forming on the surface of the cream, that is the point when you immediately take it off the heat and pour it over the chocolate morsels in the bowl. Wait 1 to 2 minutes to warm up the chocolate morsels. Then, stir this mixture with a metal spoon until it is a smooth consistency. It takes a few minutes to get to this smooth consistency, and if it does not smooth out at your first mixing place it into the microwave for 10 seconds and stir again. You might have to repeat this process, however do not rush it, over-heating the chocolate will seize it to a hard lump, and cannot be restored. Some people are more comfortable to heat the chocolate and cream in a saucepan on the stove on very low heat and constant mixing. When you have your smooth chocolate ganache it is ready for the dipping process. To dip the strawberries I pick up the green leaves on top of the strawberry, hold them together with my fingers and dip the berry into the chocolate ganache. Lift the berry out of the ganache and let the excess drip off the berry, If you feel that it has not covered the berry sufficiently, dip it again, hold it to drip off the excess like the first time and then place the berry on top of the prepared parchment or wax paper. 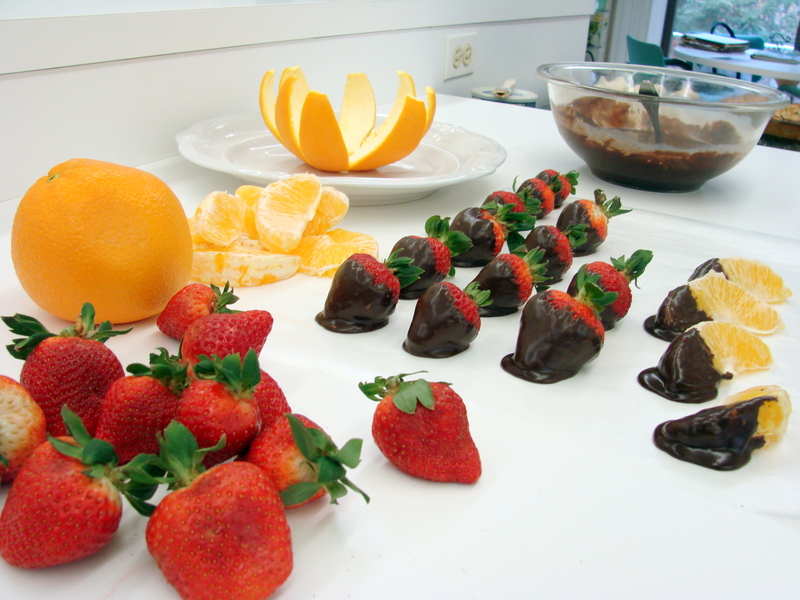 I sometimes dip orange segments into the chocolate ganache as well, it is surprisingly delicious and brings about rave reviews from my guests. I prepare this desert just a couple of hours before I serve it. The strawberry looses its flavor when refrigerated, it needs to be eaten at room temperature. Can’t wait until strawberry time. Hello Merisi in Vienna….so great seeing you here…I always love to hear from you….I lost your blog address…could you please send it to me? Hi Marisi…thank you for you nice comment…I always love to hear from you…because when I get a note from you…I feel that Vienna is not far away…I love your city…and wish I could travel there as often as I would want to…. Can’t wait to make them. Thanks for sharing. 10 days of all things strawberries! Will I see in you in San Fran? Ohhhhhhhhhhh, Francine….I would love to be with you in Tampa right now…I would eat myself through the town…..and probably get my allergy to strawberries back again….but would not care…. I still have not sent you a photograph with the apron you so generously sent me….I found it in my linen closet the other day…. will do soon………. Love those strawberries! 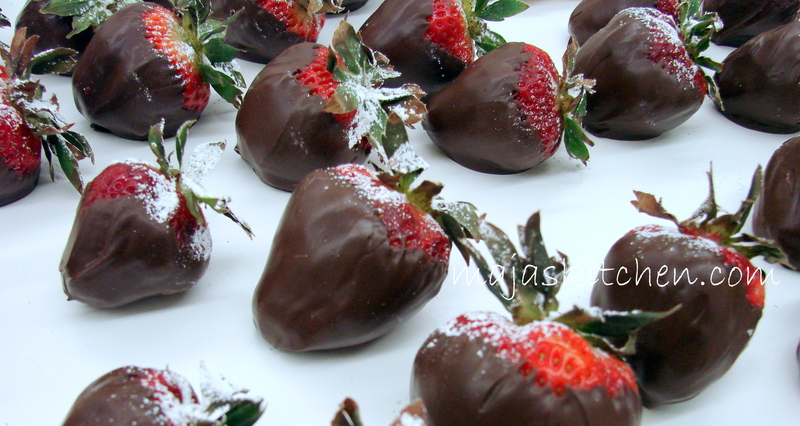 Can’t wait for strawberry season in California.I love strawberries in any recipe and especially chocolate dipped.